Background : Many newer studies reported that Epstein- Barr virus (EBV) has association with chronic lymphocytic leukemia (CLL). The average age of presentation is of patients with CLL is between 65 and 70 years with male to female ratio is 2:1. Notably, several studies have reported that expression of Epstein Barr encoding RNA (EBERs) is associated with progressive or accelerated clinical courses. This type of RNA increases the level of IL-8 and IL-10 in serum of newly diagnosis of CLL patients. Objectives: the aims of study were to determine the interleukins 10 and 8 level in newly diagnosed CLL patients and determine the incidence of EBV infection in patient of CLL. 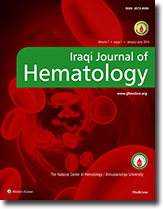 Materials and Methods: A prospective study conducted at department of clinical hematology in the national center of hematology in Baghdad, Iraq from January 2013 to January 2014. It included thirty samples of formalin-fixed, paraffin-embedded tissue of bone marrow aspirates samples and blood from newly diagnosis B-CLL. They were diagnosed with CLL according to Binet criteria. The detection of EBV encoded RNAs (EBER1, EBER2) and also detection for the level of Interleukin (8 and 10) in the serum of CLL patients were done by in situ hybridization technique. Results: Histopathological study revealed that all the controls were negative for EBERs and 46.7% were found to be EBERs positive. There was a correlation between positive EBERs and tumors stage and also EBERs and IL-10 and with IL-8. Conclusion: The highest incidence of CLL occurs in the age group 40-80 years old and males are more liable than females (male/female: 70/30).In situ hybridization technique is successful method to detect of EBV and positive EBERs. IL-8 is highly significant in CLL patients and correlates with EBERs and LMP1. There is a correlation between IL-10 EBERs and LMP1 in CLL patients. Background: Lymphoma growth and progression appear to be promoted by at least two distinct angiogenic mechanisms: autocrine stimulation of tumor cells via expression of Vascular Endothelial Growth Factor(VEGF) and Vascular Endothelial Growth Factor Receptor(VEGFR) by lymphoma cells, and paracrine influences of the proangiogenic tumor microenvironment on local tumor vascularity. Objectives: To assess autocrine effect of VEGF, by studying the correlation of VEGF expression with its receptor VEGFR expression in NHL. And to assess paracrine effect of VEGF, by studying the correlation of VEGF expression with CD34 expressed on endothelial cells in Non-Hodgkin Lymphoma (NHL). Materials and Methods: A cross sectional study was designed. A total of 66 bone marrow tissue samples were included in the study, all diagnosed as having NHL according to working formulation. From each block, 3 sections were taken, and were immunohistochemically stained for CD-34, VEGF and VEGFR. Scoring of Immunohistochemical staining was performed using specialized automated cellular image analysis system, Digimizer software, version 3.7.0. Results: VEGF Immunohistochemical digital parameters named digital labeling index (DLI) was significantly correlated with the followings; VEGFR (DLI) [P =0.042, r =0.324], CD34 stained area (A) [P=0.037, r =0.556]. Also VEGFR (DLI) was significantly correlated with CD34 (A). Conclusion: Autocrine and paracrine effect of VEGF is evident in NHL, as there is positive correlation between VEGF expression and VEGFR expression, and as tumor vascularity increase with the increase in VEGF expression. Background: Plasma iron is increased in preeclampsia (PE) in comparison to normal pregnant women. The relation between iron homeostasis and inflammation is hepcidin. Hepcidin is an acute phase reactant protein which has major role in iron hemostasis. Objectives: To evaluate serum iron, total iron binding capacity (TIBC), serum ferritin and serum hepcidin levels in preeclamptic pregnant women in relation to non preeclamptic pregnant women, who were not on any iron supplement regimen. Materials and Methods: This case control study was conducted on twenty pregnant women in the third trimester of pregnancy suffering from preeclampsia that had not received iron supplement or had blood transfusion within last three months, those patients attended the obstetrics and gynecology department at (AL-Imamin AL-Kadhmin medical city) between May to August 2013. Along with those patient twenty non preeclamptic pregnant women who were age and gestational age matched were included as control group. Moreover any subject presented with active infection, chronic diseases, chronic blood loss or twin pregnancy was excluded. A total of 5 ml of venous blood sample was obtained from each patient and control and tested for measurement of Hb, PCV, and MCHC by automated device whereas, serum of iron and TIBC, ferritin and hepcidin were measured by ELISA technique. Results: The mean level of Hb, PCV, MCHC, serum iron, serum ferritin and serum hepcidin in preeclamptic patients were higher than those of control group (P value of < 0.05).There was a non- significant correlation between serum iron and hepcidin in preeclamptic patients (r=0.234, P= 0.32) whereas there was a significant strongly positive correlation between serum iron and hepcidin in the control group (r=0.839, P = 0.003). Conclusions: In preeclamptic patients serum iron concentration is increased in spite of high hepcidin concentration which might indicate a resistance to the iron-decreasing action of hepcidin. Background: Complete blood count (CBC) is the most commonly requested test by physicians. The central child teaching hospital is the second largest pediatric hospital in IRAQ. We review the CBC for the first half of 2015 at that hospital. Objectives: this study was arranged to explore the prevalence of anemia, leucocytosis, leucopenia, thrombocytosis, thrombocytopenia, using automated CBC counter Emerald & Ruby Abbott for outpatient and inpatients respectively. Patients and methods: A retrospective study included a total of 19341 patient attended central child teaching hospital (from the 1st of January -1st of July 2015). All of them did complete blood picture test using ruby Abbott and emerald Abbott hematology autoanalyzer, 14418 of them were inpatients and 4723 patients attended to the outpatient clinic . Results: the results were analyzed as anemia, leucocytosis, leucopenia, thrombocytosis, thrombocytopenia for the whole patients and for each month to the inpatients so that to analyze the result according to season. Anemia was seen more commonly in the inpatients (30.79%) than the outpatient (20.8%). Leucopenia was seen more in outpatients (17.15%) than in inpatients (8.1%), while leukocytosis shown to be (10.8%) of inpatients and 2% of outpatients. Thrombocytopenia was (8.3%) of inpatient and (3.1%) of outpatients. Regarding the monthly incidence we found that the highest percentage of anemia in outpatients seen at May (42%), while the lowest was seen at January (19.76%).Leucocytosis and thrombocytosis both showed the highest percentage at January (19.76%), (15.29%) respectively. Conclusion : anemia, leucocytosis, and thrombocytosis seen in inpatients more than outpatients ,leucopenia seen in outpatients more than inpatients ,thrombocytosis showed near results for in and out patients but a little higher for inpatients. Background: Among more than 30 blood group systems, nine of them namely ABO, Rh, Kell, Kidd, Duffy, MNS, P, Lewis and Lutheran are considered to be clinically significant. The distributions of these blood groups are different between populations across the world. Studies about the frequency of blood groups in Kurdish ethnicity are very limited in the literature. Objectives: to explore the distribution of red cell antigens and phenotypes of various blood groups among Kurdish population using different systems. Materials and Methods: five thousand blood donors attending the central blood bank of Sulaymaniyah province were randomly selected and tested for ABO and Rh antigens (D, C, c, E, & e) by using tube method. 500 donors were randomly selected and further analyzed using other blood group systems. Results: In the ABO system, the most common phenotype was O (37%), followed by A (32.6%), B (22.8%) and AB (7.6%). Among the Rh blood group antigens, e was the most common (95.2%) followed by D (91.3%), C (74.8%), c (69.4%), and E (30.6%) with DCe/DCe(R1R1) and dce/dce(rr) being the most common phenotypes among Rh-D+ve and Rh-D-ve groups, respectively. The most common phenotypes for other blood systems were as follow; Kell(K-k+,94%), Kidd(jk a+b+,44.5%), Duffy(fy a+b+,45%), Lutheran(Lu a-b+,92%), Lewis(Le a-b+,54.5%), P(P1,76%), MNS(M+N+S-s+,40%) Conclusion: the various red cell antigens recorded by different blood grouping systems in this study was intermediate between the European and Asian countries with some specificity to the Kurds population reflecting the distinct geographical area and preserved ethnic background of the Kurds in the region. Background: Factor XIII deficiency is one of the rarest bleeding disorders with an estimated prevalence of 1in 3 million populations worldwide. The main clinical manifestations of the disease are delayed wound healing, recurrent miscarriage, intracranial bleeding, and prolonged umbilical cord bleeding. Objectives : The aim of this study was to assess the diagnosis and treatment of factor XIII deficiency in Children Welfare teaching hospital in Baghdad. Patients and Methods : This retrospective study was performed on thirty three patients with the severe factor XIII deficiency. The diagnosis of the disease was done by a wide spectrum of characteristics which is part of inclusion criteria and including family history, clinical manifestations, laboratory tests, clot solubility in 5 M urea or monochloroacetic acid environments. Results : the common manifestations of the disease at time of diagnosis were bleeding after trauma (42.4%), umbilical cord bleeding (21.2%)and less frequently gum bleeding and ecchymosis. Conclusions : factor XIII deficiency is a rare disease in Iraq, most patients are diagnosed at the age of 1-10 years, family history was positive in more than half of the patients. Background: Bone marrow aspiration and trephine biopsy have an important role in evaluation and diagnosis of most hematological and some non hematological disorders. Objectives: The aims of this study were to assess the value of bone marrow examination in diagnosis of hematological diseases and determination of frequency and causes of dry tap marrow . Patients and Methods: This study was prospective only and it was conducted from January 2013 to June 2013 at Hiwa and Nanakaly hospitals in Sulaymaniyah and Erbil respectively. A total number of 245 cases were underwent bone marrow examination. Touch imprint was prepared in a state of dry tap marrow. Sudan black stain was used in acute leukemia. Results: The patients comprised 138 (56.3%) males and 107 (43.7%) females, with ages ranging from 1 to 81 years and the mean age of cases was 36.7΁ 24 years. The most frequent clinical finding of patients underwent bone marrow examination were pallor (71.4%), followed by fever (32.2%). The main indications were present of blast cells in peripheral circulation 69 (28.2%), followed by bone marrow assessment for staging of lymphoma 37 (15.1 %). The most common diagnoses encountered were: Acute leukemia 69 (28.2%), Active marrow (negative for lymphoma) 27 (11.1%) and active marrow 24 (9.8%). The frequency of dry tap was (4.08%) and the most common causes were: acute leukemia and faulty technique (normal marrow). Conclusion: Bone marrow examination is an important diagnostic tool in the diagnosis and staging of various hematological disorders. Background: Rheumatoid arthritis (RA) is a chronic systemic inflammatory autoimmune disease characterized by articular and extra-articular manifestation as weight loss, fatigue, malaise, and anemia. Objectives: The aim of this study was to find the prevalence of different types of anemia and its correlation with the disease activity among patients with RA in Sulaymaniyah province and to determine the associated risk factors. Patients and Methods: A cross sectional study carried out in Sulaymaniyah general medical Hospital for periods from October-2014 to the end of June-2015.A convenient sample of 100 rheumatoid arthritis patients were selected from patients seen in the rheumatology clinic. One hundred healthy voluntary controls of same age groups were selected and same parameters for diagnosis of anemia are used in both groups. Results: The prevalence of all types of anemias among the rheumatoid Arthritis (RA) patients was 40% which more than that found in control group. The common types of anemia was anemia of chronic disease (28%), iron deficiency (10%), thalassemia minor (1%), and megaloblastic anemia 1%. We found a significant correlation of RA with each low hemoglobin, low hematocrit, high leucocyte count and high ESR. Anemia among RA patients in our study was significantly more prevalent among low socioeconomic status patients. The majority of RA patients had moderately or high active disease, which revealed no association between disease activity and anemia (p value=0.3). Conclusion : the prevalence and types of anemias among RA patients in Sulaymaniyah was comparable to that found in other studies and it was two times common than the normal healthy peoples. In our study we concluded that little evidence found between disease activity and anemia. Background: Pancytopenia is a triad of low hemoglobin, white blood cells and platelets. Although it is a common clinical problem with an extensive differential diagnosis, there is a relatively little discussion of this abnormality in major textbooks of internal medicine and hematology. Objectives: This study aimed to determines the etiology and clinical profile of pancytopenic patients attending Nanakaly hospital. Materials and Methods : During a period of 6 months, 60 pancytopenic patients attended Nanakaly hospital, their ages ranged between one-81years. A control group of 50 age-matched apparently healthy person were tested for complete blood picture and reticulocyte count. History, physical examination and hematological parameters at presentation were recorded. Hematological profile included hemoglobin, total and differential leukocyte count, platelet count, reticulocyte count, peripheral blood and marrow smears together with marrow biopsy were assessed. Pancytopenic cancer patients on chemotherapy were excluded. Pancytopenia was defined as hemoglobin less than 10g/dl, WBC less than 4 x109/L and platelet count less than 150 x 109/L. Results: The mean Hb concentration, WBC count and platelet count in studied group were significantly lower than in control group. Hematological malignancies were the commonest cause of pancytopenia and accounted for (51.7%), they included: Acute leukemia (35%), myelodysplastic syndrome (11.7%), hairy cell leukemia (3.3%) and myelofibrosis (1.7%). Aplastic and megaloblastic anemia each of them accounted for (16.7%), hypersplenism was responsible for (10%). Other less common causes included enteric fever, kalaazar and secondary metastasis each of them accounted for (1.7%). Pallor was present in every case. Fever was present in (63.3%) and (25%) had bleeding manifestations at the time of presentation .Conclusions : The most common causes of pancytopenia were acute Leukemia, aplastic anemia and Megaloblastic anaemia, but rare causes like myelofibrosis, enteric fever, kala azar and secondary metastasis should also be kept in mind.